Recently I worked in another Maine city and was astonished at the number of patients I encountered who were using heroin. I had never seen anything like it, during a lifetime practicing medicine. In New Hampshire, it was said, deaths from heroin now exceed deaths from car accidents. Massachusetts (population under 7 million) had 1,000 deaths related to (all) opioids in 2014, "the highest ever recorded." According to CDC, in the two years between 2010 and 2012, heroin overdose rates in the Northeast tripled. The US now has 600,000 heroin users, triple the amount of five years earlier, according to the Drug Enforcement Agency. Or it may instead have between 800,000 and 2.6 million, according to RAND report estimates published by the White House in 2014. I've heard stories on NPR about insufficient state funding of heroin treatment facilities. I've heard about plans to make the antidote Narcan (naloxone) available to drug users, for overdoses. (Since I wrote this piece, a nasal spray version of Narcan has been approved for narcotic overdoses by FDA, and the drug may now be purchased without a prescription.) 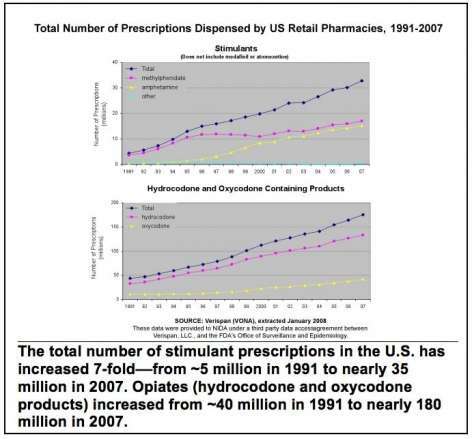 Another popular angle I've seen repeated over and over (and one currently pushed by the US Drug Enforcement Agency and the White House Office on National Drug Control Policy) claims legal prescriptions for narcotics increased, then became harder to get, so users switched to heroin, which was also cheaper. Marijuana used to be claimed the "entry" drug to heroin, but now prescription narcotics have assumed that role. How times change. The narrative that has been presented to us implies that massively increased heroin use has nothing to do with increased supply. (This violates the laws of arithmetic and economics, not to mention common sense.) In Europe, West Asia and Russia, everyone knows their rising numbers of addicts reflects a huge increase in available heroin. But the media obscure that fact, here. If increased prescriptions for controlled substances was the primary cause of the heroin epidemic, then Americans would also be using more cocaine. 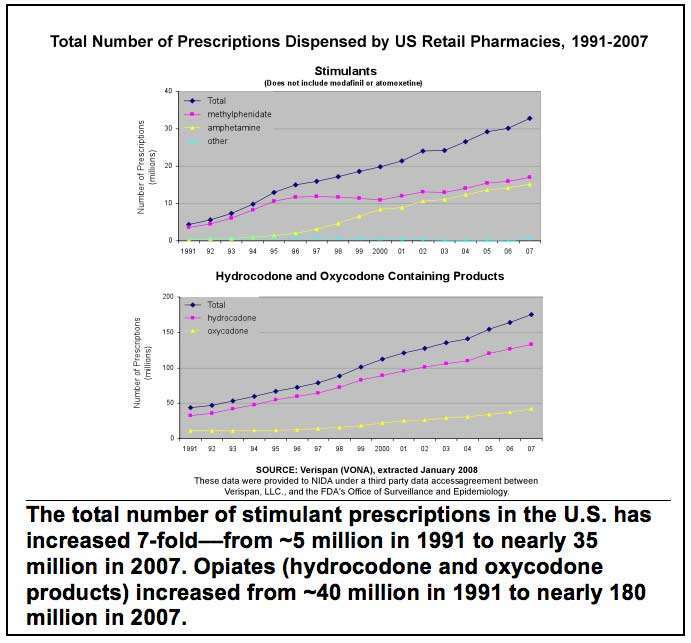 The massive increase in ADHD drug prescriptions (presumed "entry" drugs for cocaine) should have caused a cocaine explosion. But in fact, the DOJ-DEA 2014 National Drug Threat Assessment Summary notes that cocaine availability "remains stable at historically low levels throughout most domestic markets along the East Coast." A RAND Report noted, "From 2006 to 2010, the amount of cocaine consumed in the United States declined by about 50 percent — an unprecedented change over five years." There has been a parallel decline in methamphetamine use. You can frame stories about the current heroin problem in many ways. But the real heroin story isn't being discussed--which is that since the US military entered Afghanistan in 2001, its opium production doubled, per the UN Afghanistan Opium Survey 2014, page 34. The area under opium cultivation in Afghanistan has tripled. And the resulting heroin appears to more easily make its way deep into our rural, as well as urban communities. CDC noted, "Between 2002 and 2013, the rate of heroin-related overdose deaths nearly quadrupled, and more than 8,200 people died in 2013." By 2014 there were 10,500 heroin overdose deaths, 6 times as many as in 2001. The world supply of opium increased 5-fold between 1980 and 2010, according to the UN. "Afghanistan account[s] for around 90% of global illicit opium production in recent years. By itself, Afghanistan provides 85% of the estimated global heroin and morphine supply, a near monopoly. "(see pp 37-38). “The narcotics trade poisons the Afghan financial sector and undermines the Afghan state’s legitimacy by stoking corruption, sustaining criminal networks, and providing significant financial support to the Taliban and other insurgent groups,” John F. Sopko, the Special Inspector General for Afghanistan reconstruction, said in an October 2014 letter to the heads of the Departments of Defense, State and Justice, which have all played major roles in the failed drug intervention effort. “Despite spending over $7 billion to combat opium poppy cultivation and to develop the Afghan government’s counter-narcotics capacity, opium poppy cultivation levels in Afghanistan hit an all-time high in 2013." Despite the (now) US $8.4 billion spent to defeat this trade, it just keeps growing. The costs of US reconstruction efforts in Afghanistan total "$110 billion, after adjusting for inflation, [which] exceeds the value of the entire Marshall Plan effort to rebuild Western Europe after World War II" according to the Special Inspector General for Afghanistan Reconstruction, speaking in May 2015. The Special Inspector General noted elsewhere that, "US reconstruction projects, particularly those devoted to “improved irrigation, roads, and agricultural assistance” were probably leading to the explosion in opium cultivation." Only 1.2% of the acreage used for Afghan opium production (which is estimated at 224,000 hectares or 554,000 acres) was eradicated in 2014, according to the UN. Burma (now Myanmar) is the world's second largest producer of opium, according to the UN, currently growing only about 10% as much as Afghanistan. But Mexico has increased production and is #3. According to the UN World Drug Report, in the 1990's Afghanistan supplied opium that was converted into half the world's heroin production. According to University of Wisconsin Professor Alfred McCoy, the rapid 1980s rise in Afghani opium production came about through CIA efforts to create, arm and fund the mujahedeen using opium sales. (After defeating the Soviets in Afghanistan the mujahedeen morphed into Al Qaeda). By 2010, Afghanistan supplied 90% of the world's total heroin. But the DEA, White House and other official US sources claim that US heroin derives almost entirely (96%) from Latin American-grown opium (based on seizures of shipments); the DEA in 2014 claimed that Latin America was the source for the vast majority of US heroin, with southwest Asia (i.e., Afghanistan) accounting for only 4% of US heroin in 2012. This is highly unlikely. In 2008, the UN estimated that the US and Canada accounted for 13% of global heroin use. Ninety-five percent of global heroin derives from Afghanistan, Burma, Thailand and Laos. Latin America (mainly Mexico, with a small amount from Colombia) does not produce enough to supply even half of US heroin, let alone 96%. In fact, the White House Office of National Drug Control Policy undercut its own claim when it noted Mexico had (only) 10,500 hectares under poppy cultivation in 2012 and Colombia 1,100 hectares in 2009, while Afghanistan had 154,000 hectares in 2012 and 224,000 hectares in 2014 per UN estimates. Putting aside the issue of the provenance of the US heroin supply for the moment, surely we can look at heroin as we would any other global commodity. Congruent with the 1980s mujahedeen fight against the Soviets [here is the bland UN phrasing] : "...the Soviet invasion in 1979, [which] triggered the mass production of opiates in Afghanistan"] and then -- in a repeat performance -- congruent with the US presence in Afghanistan since 2001, Afghanistan rapidly expanded opium production, and the global supply of heroin increased concomitantly. The price dropped as a result. New buyers entered the market. And the US now has, at least, several hundred thousand new addicts. Russia and the rest of Europe (with overland access to Afghanistan) have even more. The resulting social problems are hugely tragic and hugely costly for millions of families, and for our societies as a whole. If we start being honest about why there is a major heroin epidemic, maybe we can get serious about solving the problem with meaningful eradication and interdiction. Aerial spraying of crops with herbicides or similar methods has been prohibited in Afghanistan, but it works. In 2014, Britain's former Ambassador to Afghanistan (2010-2012) called for legalization and regulation of illicit drugs as one means of attacking the problem. Looking beyond the Mexican border for heroin, and inspecting all flights from southwest Asia, including military and CIA flights, could have a large impact on supply as well. Serious measures are needed. Total world production of opiates always gets consumed: historically, the market for opiates has been extremely elastic. 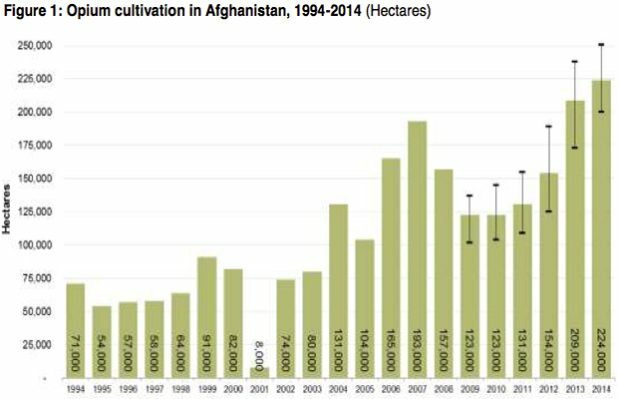 Land under poppy cultivation (in Afghanistan, Southeast Asia's Golden Triangle and Mexico) continues to increase. Without meaningful efforts to reduce opium production and entry of narcotics into the US, the epidemic of heroin addiction could become a considerably bigger problem than it is today. UPDATE: From the Sept 7 Wall Street Journal, we learn that a US "friendly fire" airstrike in southern Afghanistan on Sept 6 "hit a 30 member elite counternarcotics police unit as they were on a mission..."
At least 11 died in "one of the deadliest friendly fire incidents in the country in recent years." Here is the Reuters story. The US denied the strike in Helmand province, but admitted to airstrikes in the adjacent province of Kandahar. According to the Guardian, "The US is the only member of the NATO coalition known to have carried out bombing raids in Afghanistan this year." The AP/WaPo on 9/8/15 reported that, "Brigadier General Shoffner [Deputy Chief of Staff for Communications in Afghanistan] said 'based on information we received [on 9/8], we feel it is prudent to investigate the airstrike our forces conducted in Kandahar.'" The airstrike killed approximately as many people as died in counternarcotics efforts in all Afghanistan throughout 2014. UPDATE: Helmand is the major opium-producing province in Afghanistan; military efforts in Helmand are managed primarily by the UK. In 2010, the magazine The Week accused UK soldiers of importing heroin back to Europe and Canada in military planes. UPDATE: I have marshalled considerably more evidence about the false narratives that been spread regarding the current heroin epidemic. Their purpose is to misdirect us away from the true cause (massively increased heroin entering the US) and solutions (interdicting or destroying the Afghan opium crop). Since I wrote this piece, the US's top General in Afghanistan, John Campbell, told Congress we need a five year plan for US and NATO involvement in Afghanistan. What precisely are we doing there? What does CIA do there? Why has the US military been prevented from stopping opium production in territories it controls? Does an even worse Afghan heroin epidemic in Russia affect US strategic thinking? What did Hillary Clinton know and do about rising Afghan heroin production during her time as Secretary of State? Why aren't these questions being asked of our Presidential candidates? Let me credit Professor Alfred McCoy's work, which provided me historical background: he is probably the world's foremost scholar on the subject of the global production and trade in illicit drugs.